Filarids rely on different insect species to be transported from animal to animal. The specific filarid causing heartworm in dogs and cats is known as Dirofilaria immitis. Dogs or other animals harboring adult worms are the recognized reservoir of heartworm infection. The disease is spread by mosquitoes that become infected with microfilariae while taking a blood meal from an infected dog. Within the mosquito, the microfilariae mature into the infective larval stage. When the mosquito then bites another dog, cat, or susceptible animal, the larvae are deposited on the skin and actively migrate into the new host. For about 2 months the larvae migrate through the connective tissue, under the skin, then pass into the animal’s venous blood stream and are quickly transported to the arteries of the lung. It takes a total of approximately six months for the infective larvae to mature into adult worms that begin producing offspring, microfilariae. Adult heartworms can live for five to seven years in the dog. In the dog, the larvae progress in their development to an adult form of the worm, and live in the pulmonary vessels, where they continue the life cycle and cause extensive injury. The period of time when heartworms are reproductively capable is referred to as patency. 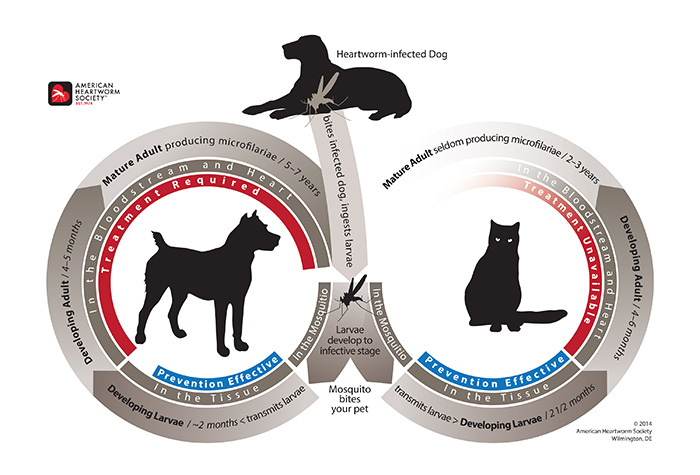 The first published description of heartworm in dogs in the United States appeared more than 100 years ago in an issue of “The Western Journal of Medicine and Surgery.”1 Heartworm in cats was first described in the early 1920’s. First, adult female heartworms release their young, called microfilariae, into an animal’s bloodstream. Then, mosquitoes become infected with microfilariae while taking blood meal from the infected animal. During the next 10 to 14 days, the microfilariae mature to the infective larval stage within the mosquito. After that, the mosquito bites another dog, cat or other susceptible animal, and the infective larvae enter through the bite wound. It then takes a little over 6 months for the infective larvae to mature into adult worms. In dogs, the worms may live for up to 7 years. Heartworm infection in apparently healthy animals is usually detected with blood tests for a heartworm substance called an “antigen” or microfilariae, although neither test is consistently positive until about seven months after infection has occurred. Heartworm infection may also occasionally be detected through ultrasound and/or x-ray images of the heart and lungs, although these tests are usually used in animals already known to be infected. Because heartworm disease is preventable, the AHS recommends that pet owners take steps now to talk to their veterinarian about how to best protect their pets from this dangerous disease. Heartworm prevention is safe, easy and inexpensive. While treatment for heartworm disease in dogs is possible, it is a complicated and expensive process, taking weeks for infected animals to recover. There are a variety of options for preventing heartworm infection in both dogs and cats, including daily and monthly tablets and chewables, and monthly topicals. All of these methods are extremely effective, and when administered properly on a timely schedule, heartworm infection can be completely prevented. These medications interrupt heartworm development before adult worms reach the lungs and cause disease. Usually, all but the most advanced cases of heartworm disease can be successfully treated in dogs. Currently, there are no products in the United States approved for the treatment of heartworm infection in cats. Cats have proven to be more resistant hosts to heartworm than dogs, and often appear to be able to rid themselves of infection spontaneously. Unfortunately, many cats tend to react severely to the dead worms as they are being cleared by the body, and this can result in a shock reaction, a life-threatening situation. Veterinarians will often attempt to treat an infected cat with supportive therapy measures to minimize this reaction; however it is always best to prevent the disease. It is your responsibility to faithfully maintain the prevention program you have selected in consultation with your veterinarian!